This interesting surname recorded in some two hundred forms from Martin and Martini to Marti and Martinovich, is of Roman origin. It derives from "Mars", the god of fertility and war, although it is claimed that "Mars" itself may derive ultimately from the word "mar", meaning "to gleam". The original given name has been used in every state in Europe since the 12th century crusades to free the Holy Land from the Moslems. However the main impetus which gave the name such popularity was as a result of the good works of the 14th Century Saint Martin of Tours, in France. 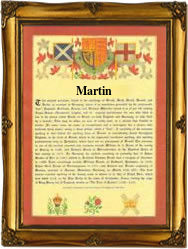 It is sais that Martin is one of the few saints names which the protestants accepted after the reformation. There are many patronymic forms such as Martinez (Spanish) or Martenssen (Swedish), and diminutives such as Martineau (France) and Martinelli (Italian). Curiously the Polish spellings of Marcinkowski and Marciszewski are locational, originating from a town called Martin, as is the Czech Martinovsky. Examples of the surname recordings taken from authentic registers of the period include John Martin of Plymouth, England, who was navigator to Sir Francis Drake, on his first "Round the World" voyage of 1577, whilst Christopher Martin was a member of the Pilgrim Fathers in 1620. Suarez Martinez was christened at Asuncion, Mexico, on October 2md 1774, whilst Jack Martinet was registered at Berkeley, California on September 27th 1909, and Jeffrey Lynn Martineau at Los Angelos on April 10th 1948. The first recorded spelling of the family name is shown to be that of Walter Martin, which was dated 1166, in the charters of the county of Northampton, England, during the reign of King Henry 11, known as "The Builder of Churches", 1154 - 1189. Surnames became necessary when governments introduced personal taxation. In England this was known as Poll Tax. Throughout the centuries, surnames in every country have continued to "develop" often leading to astonishing variants of the original spelling.